Long before before the smoking, chip-munching masses start to steadily shuffle by, I’ve always found there is something very special being around The Valley early on a match day. Camouflaged by dirty streets and standard suburban residence, it is not until you advance down Floyd Road to such an extent that you virtually touch the club shop with your fingertips that you find yourself ‘there’. Hours before KO, that vantage point replicates the opening scene of a film as the quiet stillness is suddenly replaced by a hive of activity emerging ahead. Programme sellers busily drag their stands into position, deliveries are being rushed in and out of vans, and burger sellers are busy frying their onions. The sounds, the smells, the buzzing energy not too dissimilar to the early morning preparation of a popular street market from a bygone era; the awakening signs that somewhere is about to 'come alive'. I love this place. London is awash with landmarks and viewpoints, but for me there is no better sight than walking down Floyd Road and seeing that ground slowly emerge behind Number 84. Nowhere else generates that bit of excitement and adrenaline that you get at that point in anticipation of what lies ahead. I first walked down this road with my dad in 1984, and I didn't get to do it again for a matchday until 1992 as a 16 year old. By the latter visit I was already in love with Charlton Athletic, and from that point on I become steadily smitten with this nostalgic SE London landmark that has grown to feel like my second home. Passing the ground early is not a novelty; since 1992 it has been a frequent walk of mine on the way to the Oak to meet pals for a few pre-match beers. 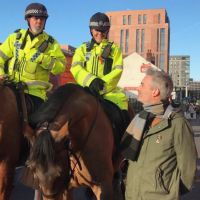 In recent years, that social interaction and alcoholic numbing has increasingly become the main factor that continues to draw me habitually to what has always been, to me at least, a happy Valley. But as I meander down Wellington Gardens towards the shops by the station, I think of why I’ve made this early journey today when I’m not going to the pub? Why I am donning a black and white scarf? Why have I come away from my kids to stand on a cold November morning to hand out leaflets trying to rally support for a protest. The answer is simply because I am not happy. I just don’t like what Charlton has become and aside from ‘stop going’ (which thousands of others have clearly done), this is my only way of showing it before it gets to the point where I join them. But why am I not happy? Why am I’m aligning myself with a campaign which, if I’m honest, I don’t really give a damn about its core aims and objectives? I don’t really care about working groups, meaningful dialogue, sharing budgets and timeframes etc. Sure, I can see why some are, and its collectiveness is an indicator of some of the communication issues negatively impacting this regime. But that is not what angers me; I can go with all of that if things on the pitch are going ok, and I can also live with the fact we are owned by someone who is clearly a bit different, who never watches us, and I can’t for the life of me understand what pleasure he must get from his ownership. But the football decisions / strategy of the Club I just can’t get on board with, and I haven’t been from pretty much since Day 1. The interference in team affairs from outside the club’s football management, the short-term dumping of a host of underperformers off the wage bill of other network clubs onto ours, the continued lack of respect giving to the importance of knowledge of English football (and the Championship specifically), the continued provision of a completely unbalanced and bare squad, and the bizarre signings and disappearance of numerous players such as Polish Pete, Tucudean and LePoint. The managerial appointments have been bonkers. As much as I love Chris Powell, I can fully understand that when RD arrived he wanted his own man in, that happens all the time in football. Riga brilliantly won over a hostile crowd to a level not seen since Rocky triumphed in Russia, and was promptly rewarded with the heave ho. It just didn’t make sense and should have sent alarm bells ringing to every single fan, but it didn’t. Peters was exposed within a couple of months of being a terrible man manager, whilst it took a few more months for Luzon to be equally found out as tactically rigid, and unwilling to utilise the Championship knowledge from insiders like Damian Matthew and Phil Chapple. The latest choice for the job is a man who has never properly managed, and is effectively a statistics man; a computer scout. With him is a well-respected ex-player, but an inexperienced coach who only has just one year of teaching youngsters under his belt and no experience of senior coaching. Once again, a cheap option of shifting people around already on the payroll with no sign of seeking to address the fundamental most important thing about a football club. And two years on, our player recruitment is still be governed by a computer and a couple of analysts in Belgium. Saturday was the biggest example you will ever see of an opposition not particularly better than us, but tactically experienced enough to know how to win, and win comfortably. Whilst West Ham may have adopted the ‘more than a football club’ motto, it has always rung pertinently true with regards to Charlton. Our successful supporter involvement shines out in our history and is one of our USP’s as a club. But now I feel there is a complete disregard for supporter feeling, history and engagement. Not just on big issues like the managerial appointments, but right the way down to the tiny ones like knowing only a tiny percentage of the fans want the game on the big screen, or that everyone to a man thinks the pitchside sofa is an embarrassment, yet never acting upon it. Or trying to manipulate a Q+A evening to such an extent by dragging in players and youth coaches. This is what riles me the most, and drove me to arrive early to hand out leaflets. I love this club and I feel they are taking the p*ss out of it and us collectively as supporters. No serious consideration has ever been given at any stage as to what this club wants or needs through anybody’s eyes other than Roland Duchatelet. There is simply no logical reason if you were to adopt a multi-million pound business in a foreign country that employees hundreds of people, that you would instil the role of running that company to someone that just two years prior was a trainee with a law firm in a different industry in a different country, and who has never even come close to managing even a much smaller business, or even a small team as far as I can see. None of this is personal. None of this is based on nationality or gender, and all decisions and mistakes impacting on and off the pitch can be learned from and addressed. Corners undoubtedly can still be turned (unless Ceballos takes them). But what I just don’t like is the complete unwillingness to take on board supporter viewpoints, to laugh (whether intentionally or unintentionally) in the face of supporter (customer) dissatisfaction and to be so dismissive of it. The supporters, staff and volunteers are the lifeblood for every single football club regardless of whether you are Barcelona or Bromley. A football club will never achieve anything without its supporters. And a football club that sees its supporters mainly as a hindrance is only ever going in one direction. Charlton looks to me a club that is failing both on and off the pitch, and this feels my best way of trying to influence that to change before it has severe long-term consequences. So was Saturday’s protest a success? Yes and no. The purpose was to try and make a specific point and to try and garner some extra publicity of the growing dissatisfaction, whilst not overtly impacting on supporting the team. That was clearly achieved. However, whilst it made a mockery of the downplaying the regime’s stance on the minimal extent of the discontent, it is equally fair to acknowledge it was not 100% supported, and that the advancement of protest momentum has highlighted a serious split in our support for a multitude of different reasons. I think one way or another people are belligerently nailing their colours to a specific mast, and I can’t really see that changing now. It saddens me to read the external viewpoints such as those in this Ipswich report and think why are some of our fans not similarly seeing the same, whether focused on the failing football strategy / managerial policy, or the Club’s derision of its own supporters, or just by looking around on a matchday and seeing an increasingly sparse ground completely apathetic to yet another home spanking. Was I glad I got in involved? Yes and no. On one hand, I was proud I didn’t just spout off online or in the pub, and actively did something I believe in. Thousands of others will equal, but very few will love this club more than what I do, and I was proud to stand beside others young and old on Saturday who I know also love the club deeply and don’t like where it is heading. I’m glad I acted on that and did something that took a pigeon step to try and change that, whether it was viewed as successful or not. But as I defrosted in the car on the journey home, I also sadly realised that that from a Charlton point of view unless those with strong opposing views to the protests start to see things differently, then this will only lead to an unenjoyable division, and that worries me. From a personal point of view as someone who takes ‘being a good dad’ seriously, I also felt a selfish fraud wasting the last five hours on that when I could, and most probably should, have been spending it with my kids. I’m sure I wasn’t the only one who felt the same. Do I think anything will change as a result of the last few weeks? Sadly not. 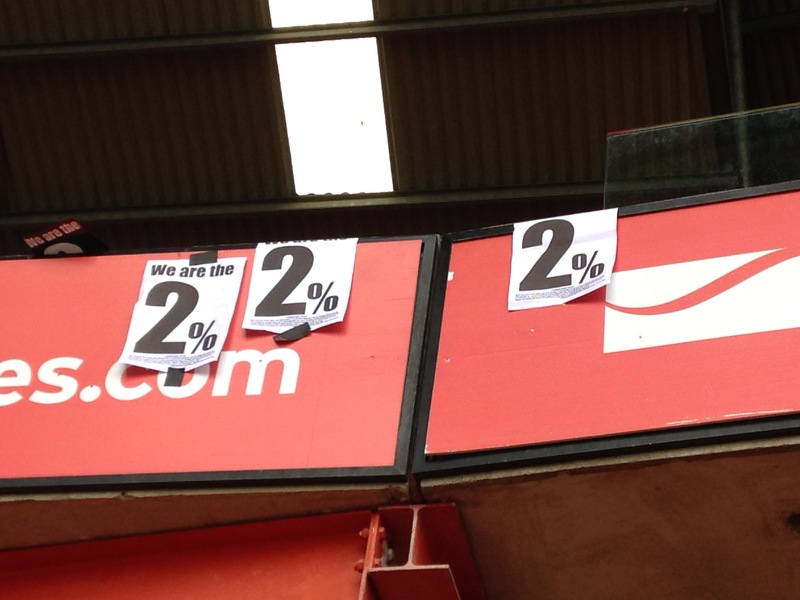 Whilst Saturday was a next step from the previous Sheffield Wednesday protest, I genuinely am starting to fear that unless there is an ownership change, or a complete turnaround in Roland’s approach that pays more than just lip service to being a traditional Championship club, I think we are in for a very dark few years where Charlton continue to shrink as a club, whether we remain at this level or drop down the leagues. Defenders will say where will be without Roland’s money?, and the genuine answer is I don’t know. But after sitting through another dismal 0-3 defeat in an empty, apathetic stadium, I think there is a strong possibility that one way or another we are screwed anyway. I’ve wrote repeatedly over the last 2-3 years of the increased supporter challenges the club faces over the next 5-10 years. That was before taking into consideration Palace’s rise, which will add further pressure to that. 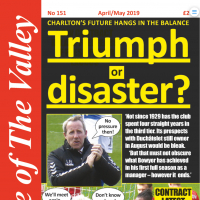 Charlton not only faces huge challenges to attract the fans of the future, there are hand over fist losing the one’s they already have, and not just through what will be the natural churn of our considerably older-than-average fanbase. What chance do we have of attracting the fans of tomorrow if we are losing so many of the fans of today? So many fans so increasingly disconnected to the Club can’t all be wrong, can they? That special feeling walking down Floyd Road will always be there. But less and less people are now walking it and I fear this will continue to be the case unless there is change. That is why i tried to give you a leaflet on Saturday. "A football club that sees its supporters mainly as a hindrance is only ever going in one direction." And that's why I and many others took one. Well said, AFKA. I worry about the divisions in the fan base, too, but much of that is created because we are not in control of the outcome/ potential solution. Surely everyone must realise that something has to change, even if we aren't quite sure how or what? My brother handed the out & me, him & my son all stood up & sung lustily for that minute, However, watching it back on TV later I felt it looked v poor with not many standing up & not v loud. Not sure what others felt but I dont think it really came across that well. I felt the reality is Golfie that very little will come across well with so few in the ground, and that any singing is totally dependent on the North Upper, which is where it seems the strongest point of the protest was and well supported. Yet even that area was pretty much deserted by NU standards and soulless on Saturday, and nothing vocal never really emerged until the anti-Belgium stuff once we went three down. Sums up a lot of my feelings Dan. Well put. I think that sums up the general feeling very well. I'm very scared of relegation this year. I seriously doubt that the current owner has the nous to get us back. Crowds collapse and a generation of hard work undone by a man who doesn't really care and will either bale out or allow his crazy experiment to reach its final conclusion. Worried for CAFC. Excellent stuff Smudge, and sadly, all very true. Hope is very powerful and contagious. Try not to lose it. You did a good job and you article carries weight . Don't stop as Saturday was the beginning not the end. No gesture is ever empty especially to the author of it. I called this as soon as they took over and I'll be very clear. I take absolutely no pleasure from being proven right. I didn't spout on here mainly because I don't have a huge amount to say that nobody else already says about football or our club, but also because I could play bingo with the responses and couldn't be bothered to continually justify myself by the medium of repetition. At that point I felt like @oohaahmortimer with his justified tirades against our appalling away support. Defenders will say where will be without Roland’s money? If RD hadn't come in then someone else would have done and, unless, we had been incredibly unlucky, that someone would have had a far better way of managing our club. By RD coming in he scuppered all chances of that happening. We lost our chance. It would have happened and RD got in the way of that. Ponder that defenders. Brilliant stuff Dan. Feel exactly the same with so much of what you've written. I am no expert in these matters but I would define that as Proper Charlton. Great article, very well put and sums up the feelings of so many of us. I am grateful to all those involved with the protest/campaign as following it online has pulled me back from that apathetic abyss of just not caring anymore & if it had been possible for me to have got to the Valley for such an early kick off Saturday I would have liked to have been able to offer my help but I am sure I will get my chance as this is going to be a long battle for our club that we all love so much. Superbly put. Couldn't disagree with any of that, and I'm good at disagreeing. The fight has gone out of me if I'm honest. Happened about the time of the meeting. We asked for her to 'spell it out' and to my mind she did that. The ambitions of the those supporting the club compared to those running it are on different planets as far as I'm concerned. I just can't be bothered with it. It's not the football club I fell in love with. It's just a business. A business being run so very badly that I really want nothing more to do with it. its certainly not getting a penny of my money or a second of my time. Yes, indeed. This is so different from The Valley Party where, although huge effort and dedication was necessary, we had, from the outset, a unity and a direction. The direction this time around is clouded and shrouded. One might say the direction is signposted as 'For the good of the club'. But who would that best serve? The supporters? How could that be so, when most of what we held dear has been undone, dismantled, and we are treated by management as ungrateful juveniles? Or is the 'benefit' ring-fenced and locked in the grip of a wealthy man who seems quite unable to engage, to liaise, and who seems driven by a mantra of 'Do it this way'? 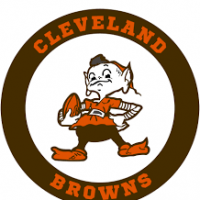 We wish for a football team that tries hard and wins more than it loses...and to do so in a construct whereby our voice is heard, acknowledged, and acted upon. These things have been in such short supply over many months and thus we witness a hemorrhaging of support as Addicks, many long in tooth, desert, their resolve unraveled and in some cases, broken. So, here we are, the rump, the smoldering remains of what was once bigger and stronger. And yet, in those ashes, lies life and spirit. We are the Phoenix and we must rise and restore what was ours. Beware Divide and Rule. Those who walk away are not cowards, nor are they a fair-weather fringe. Those who stay, come-what-may, are not blinded by loyalty to the exclusion of all else. We are all Charlton Athletic. Let us unite where we can, and give mutual support to one another. This is but a phase, a tiresome one at that, but a phase none the less. Fuel for the fire may be in short supply, but the smoldering persists! Within is the Phoenix, a creature clad in black and white which, as it rises, shows the red of its life-blood. May we rise and may we seize the day. Come on, you Addicks! As a matter of interest, what time do the players start to arrive? Seriously, very good post @AFKABartram sums up my feelings nicely. 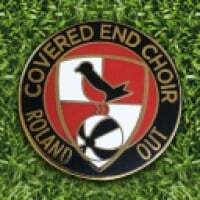 There will have to be either change of ownership or change of mind by the owner as the current strategy won't give RD a shot at promotion any time in the foreseeable futur. Sooner or later the penny will also drop about whether KM was as good an appointment as each of the coaches (excl. Riga) have been. ....Yea but, do you do aways. Well said, nodding along to an awful lot of this. Very good article. Totally agreed with all of it. I worry for our club!